Let me tell you about some of the worst 6 hours of my life. 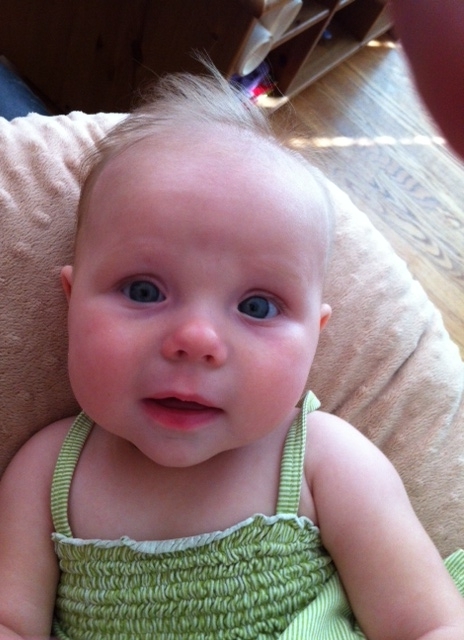 I took my six-month-old daughter to the doctor last week for her regular Well-Baby checkup. Our Family Doctor, whom I adore, was busy, so it was his Physician Assistant (PA) student who did Casey’s Physical exam. I was not impressed with the PA’s competence in conducting the exam, but didn’t press to see my doctor, as I know that my daughter is thriving and I have no concerns. As we were leaving, the PA student mentioned that she’d like my doc to come in and re-examine Casey. We waited 5-10 minutes, and she returned with a Resident doctor, who shut off the lights and shone his ophthalmoscope near Casey’s eyes. Again, my spidey senses were tingling, since my daughter was watching her brother run around the exam room, her head on a swivel; not great conditions for conducting a thorough baby eye exam. The Resident then says to me: “We are going to refer you to an Opthamologist. We are concerned that she has a Retinoblastoma”. My heart stopped. As I know from Pathology and Histology classes in my Chiropractic training, a Retinoblastoma is a rapidly-developing cancer that forms in the cells of the retina, and is the most common eye cancer in children. The Resident went on to tell me that it would be the Opthamologist ‘who would be performing the surgery’, so the next step would be to wait for the referral to go through. I left the office stunned, a mixture of terror and despair building inside me as I tried to hide my tears and keep a brave face in front of my very-perceptive 3-year-old son. As my panic-stricken brain began to process what was happening, I phoned my Optometrist in tears, looking for a second opinion. Thankfully, they squeezed us in later that day, and my husband and I were both there to witness their thorough, complete exam- which included lots of distraction techniques and clever maneuvers with the ophthalmoscope to get a clear picture of a curious six-month-old’s retina. Guess what? SHE IS FINE. No Retinoblastoma. No concerns. Without a doubt, she has two perfect little retinas. In hindsight, I can see that it was PA and Resident examiner-error that raised the red flag during retinal testing. And I am not upset by the information that was conveyed to me, I am upset at the manner in which it was presented. Medical professionals have a lot of power tied to their words, and with that power comes responsibility. It was the Resident’s responsibility to give me the full picture about Retinoblastoma’s rarity (1 in 15 000 live births), prognosis (95-98% cure rate), and differential diagnoses (examiner-error, congenital cataracts). To tell a mother that her six-month-old may have cancer and then leave the room lacks empathy, accountability, and professionalism. I’m happy to report that when my Family Doctor heard about what happened, he phoned me himself to apologize and use this as a learning experience for his staff- the exact outcome that I was hoping for, as I don’t want anyone else to experience the devastation that I felt that day. So for 6 hours, we thought our baby might have cancer. And I can’t help but think of another mother out there who was given the same news that day, only to find out it was true. I write this post for her, because for 6 hours I felt her pain, experienced her suffering, and understood her misery. But we were pardoned. We got lucky. Our outcome was favourable. And I wish the best for her too. Our youngest son was born with multiple health problems (all caused from rubella). During the first few years of his life we spent more time in hospitals and doctor’s office than we did at home. Some of the specialists we saw had all of the care and compassion of an angry IRS auditor on a bad day. However, there were others who did everything possible to get my wife and I through a very difficult time. I also have to mention the nurses — most of them were fantastic — especially the older women who had children of there own. I am so happy your daughter is fine! Empathy and compassion can go a long way in the medical field! I am sorry to hear of your son’s health problems, but glad that you met some angels along the way. What a day that must have been! You are so right that words have power, especially when delivered by someone in authority, whose opinion we trust. I am glad that your little one is alright, and that the whole thing became a teaching opportunity. Other families will benefit from your experience. Yes I think the end result was a good one- but there was lots of stress to get there! My heart was aching while reading about your day. I am so relieved she is fine and am sending the biggest hugs! Thanks Nicole! Yes, she is fine and thriving! !